Good morning! 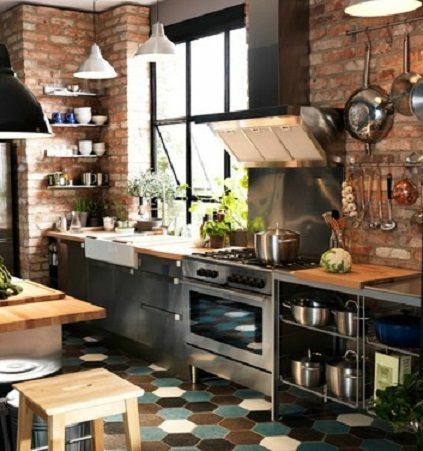 Today we want to show you some examples of industrial kitchens. If you like this kind of decoration I’m sure you’ll love these pictures. This is a style that we love, maybe not for having it in the whole home but in the kitchen it looks amazing. It looks even better if you can apply it on an ample space or an open space. In this case you can see a very beautiful kitchen in which the electrical appliances and the bricks are the main features in this place. People who like this style try to apply it in a very elegant and personal way. Apart from that, steel looks really good with a lot of different materials like crystal or fiberglass. The other material is also stones or bricks. If you can have a brick wall, you’ll master industrial style. It is a very special material and as you can see it looks very good. If you like this style, you can also apply it to living-rooms, dining-rooms and even bedroom. As you can see, it is not very difficult to apply and the result is awesome.